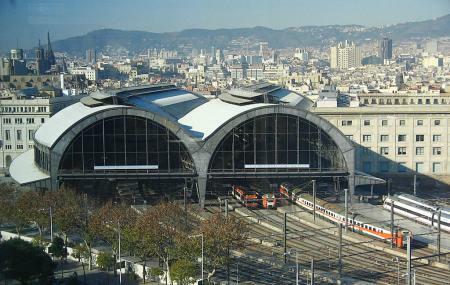 Find hotel near Barcelona Franca Railway ..
Estacio de Franca is a railway station you should explore. Station is home to restaurants and bars with lively music. The lay out of the station is lovely and the decorative ceiling is an attention grabber. What’s unique about the station is that is has a lost and found market where most locals sell the stuff they don’t use anymore at low prices. You could visit here and purchase anything that interests you. The restaurants here serve yummy bites at reasonable prices. Station looks big at the Foyle, but toilets were shut from public, most areas around the platforms are under construction and condoned off. Trains arrive and depart on time though, which is really good. Don't recall if there's any shops or they don't were open on Saturdays? Suggest to phase the construction works which give the passengers a bit more pleasant view of the station and increase ambience. One star for the location (otherwise would've given none) - despite the bar having the size of a football field, the Owner/Manager insisted on continuously keeping the music down a lot. Bottom line: If you want to have a fun party, do not choose this place! The Estació de Fança, Barcelona's grand station, is a showcase of good taste and monumental architecture. Despite its size and beauty, few trains run from the station today. As we approach the lobby and platforms we'll discover a building whose elegance has often been compared to the old Gare d'Orsay in Paris. You can go from here to the airport. If you stay at El Born area, you can take R2S from this station to Passeig de Gracia (only one stop) where you switch to R2N (airport train) on the same platform and go straight to Terminal 2. All you need is a T10 ticket. Of course, you can reach this station from airport.